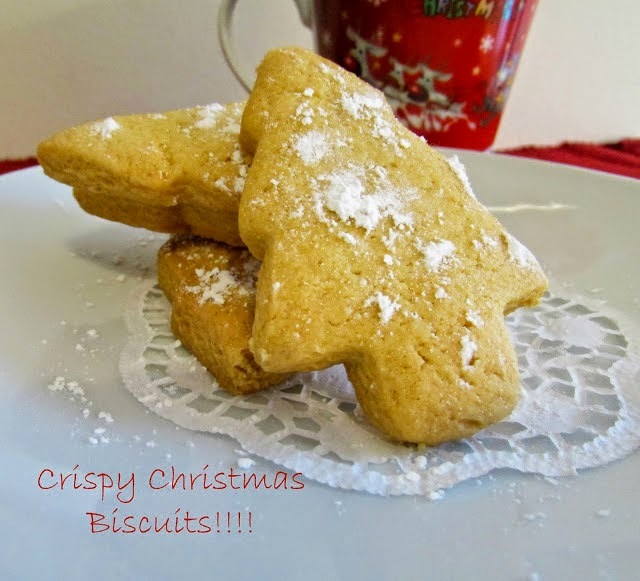 I finally managed yesterday to cook a few of my favorite biscuits for Christmas and not only of course! Delicious, crispy and full of aroma biscuits that my daughter loves and my hubby eat a lot…and my friends…and my family… and so many others! Actually is a really easy recipe to follow and with your imagination you can create masterpieces! In a bowl mix the butter and the sugar. Add the egg. When the mixture is ready add the salt and the orange icing (or vanilla). Put the baking powder in the flour and mix it and then add is slowly in the above mixture. When the pastry is ready, put it in a bowl, cover it with membrane for cooking and leave it in the refrigerator for an hour to rest. After an hour, you can create your biscuits by using cookie cutter in your beloved schema. Serve them with fine flour sugar or create a icing or even taste them without anything! They will be yummy in every way! I love Christmas biscuits! Great simple recipe too, it's nice when you find a recipe that doesn't require you to go and buy every single ingredient from the shop, instead you can find everything you need in your cupboards. Happy Holidays! Thank you Hannah! Indeed it is a recipe that needs a few materials really common in the kitchen! Mmmmm yummy!!! This recipe seems to be so easy! I will try it! Thank you for sharing! τα έκανα κ ειναι τελεια!